I just uploaded a new episode of Asian at Home last night! 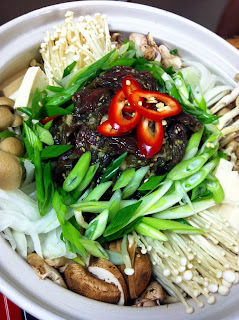 Check out my video recipe first, so you will have idea about this Korean hot pot dish. 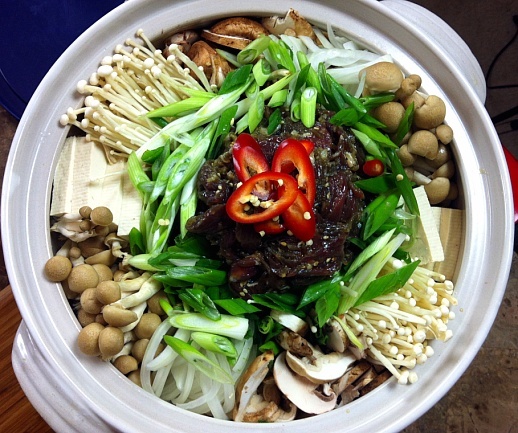 Bulgogi means Korean BBQ Beef and Jeongol means Hot Pot. 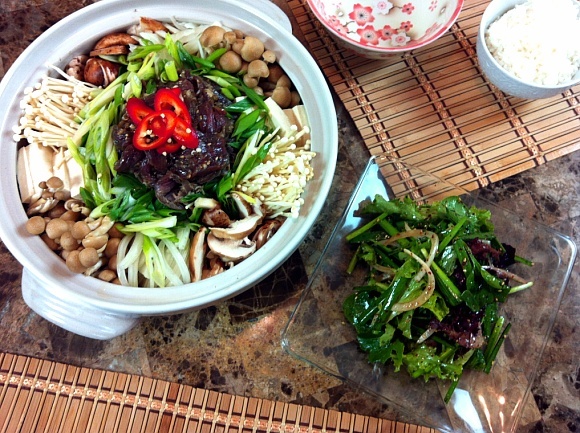 Jeongol commonly served and cooking on table. Usually every ingredients are in a pot already(as shown as the picture above), you just need to bring to boil, cook thought and eat it!!! It’s a great meal to get together with all your family and friends at the dinner table and have fun! Everyone will enjoy this type of meal at home!! 1 medium size sweet onion – 2 Tablespoons minced for beef, 1/4 of onion as chunk for broth and sliced rest of onion for later. First thing is first, Let’s marinate beef first! Combine beef and next 8 ingredients in a medium mixing bowl, mix with your hand so it will be coated evenly. Cover and marinate at least 1 hour to over night. In a medium sauce pan, add water and next 4 ingredients plus remaining soy sauce, garlic and onion. Bring to boil and take out the dried kelp when it starts boil, other wise you will have slimy texture in your broth. Simmer for 20 – 25 minutes. 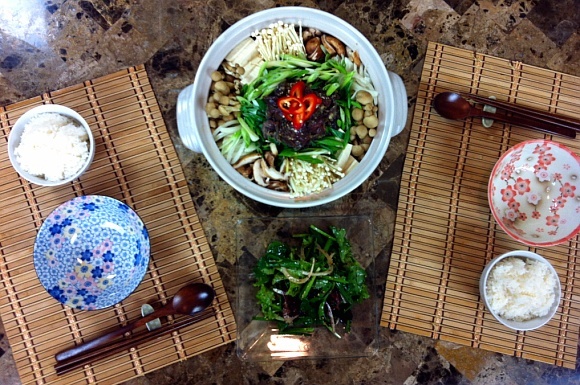 Meanwhile, assemble a hot pot with all the vegetables, arrange all the mushrooms, sliced onion, green oinon and tofu evenly. Place marinated beef right on the middle. Drain broth through a strainer and pour the clean broth into assembled pot. Now, you can start cooking and serve after it finished cooking or cooking on a table and eat as it cooks. When it starts boiling it’s time to add soaked glass noodles if you prepared. 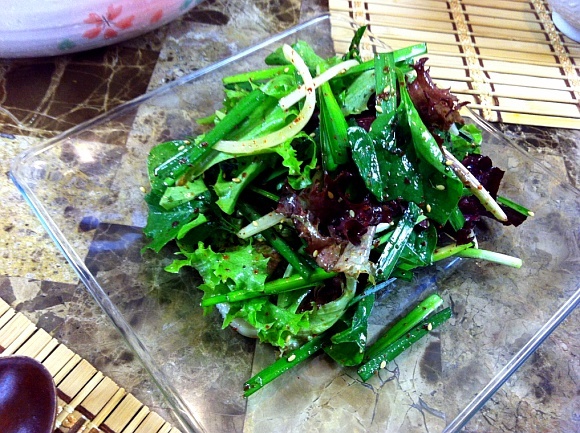 You can enjoy as it is, but if you serve with warm cooked rice, kimchi, Korean style salad(written recipe below) or any side dishes you prepared, it’s even better! *Seonkyoung’s Tip: You can ask your butcher to cut the meat paper thin. They should do it for you. But some reason they don’t, no problem! just freeze the meat in a freezer for an hour or two, slice with your sharpest knife. The idea of paper thin beef is cook as fast as other vegetables and also combine a lot better in your mouth with other vegetables. Combine all ingredients in a large mixing bowl and toss it evenly. Serve cold, best with Korean BBQ. I hope you guys try this recipe very soon, before the weather gets warm! Thank you for watching my cooking show, reading my blog, all your support and love!! !